The The SFUmu apparatus works in two orientations: With its main coils transverse to the beam direction, it is suitable for moderately-high TF measurements using backward muon beams, which do not bend too much in the applied field. 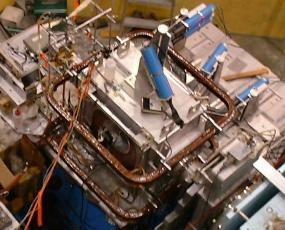 When turned axial to the beam it is another Omni spectrometer, but with a higher field limit than Omni-LAMPF. This makes it the most omni-purpose of the Omni apparatuses, but with some compromises. The prime motivation for this duality was the magnet: It delivers 6 A/G allowing experiments at 4.5 kG (0.45 T) with only 750 A supplied. The coils may run up to 850 A if the cooling water flow is sufficient, so in M20 SFUmu might deliver 0.5 T.
The drawback is the small spacing of the coils - only 3 inches - preventing side access for most counters and cryostats, and giving a quite small region of homogeneous field.